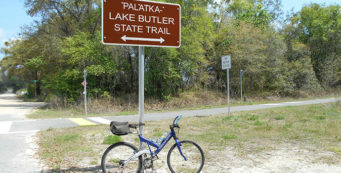 Bella Vista Trail | Florida Hikes! 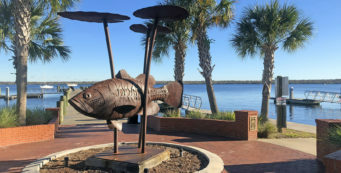 At lush Washington Oaks Gardens State Park, a treasure along the Atlantic coast, the Bella Vista Trail leads you along its white-blazed Timucuan Loop through a shady maritime hammock of red bay, southern magnolia, and cabbage palms. The patchwork of habitats along this sliver of barrier island are fully explored along this 1.8 mile loop, including coastal scrub and the northernmost extent of mangroves along the fringe of the Matanzas River. You’ll see a little of old A1A, too, which is open for bicycling. 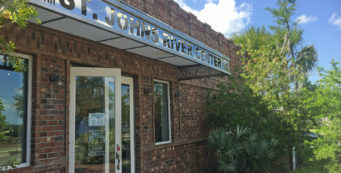 The park is along the west side of A1A, south of Marineland and 4.1 miles north of the Hammock Dunes Bridge at Palm Coast. Drive in on the park entrance road and park by the Bella Vista trailhead on the right. After you walk from the gardens across the trailhead parking area, start your 1.8-mile hike on the Bella Vista trail at the trailhead kiosk with its map. 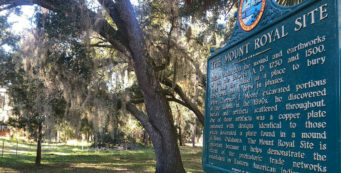 At the first trail junction, turn right to follow the white blazes of the Timucuan Loop. It meanders through the maritime hammock, under live oaks and southern magnolia, cabbage palms and cherry laurel. Wild coffee peeks out of in the shade of the underbrush— psychotria nervosa at the northern extent of its range, with its distinctive glossy green leaves, sporting dark crimson coffee beans each fall. Cross the pavement of Old A1A under an arching red bay, returning to the shade of the hammock. Live oaks create the high canopy overhead, and coontie pokes up through drifts of leaves on the forest floor. 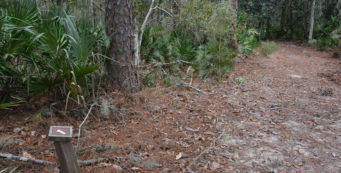 As the trail rises slightly, saw palmettos fill the understory, and you enter an oak scrub, a collection of spindly bluejack oaks and gnarled sand live oaks no more than 15 feet tall. Looking off to the right, you can see blue sky beyond the trees. Only FL A1A divides this forest from the coastal dunes. The trail veers to the left, entering an older, taller hammock of American holly and red bay. The forest becomes denser and darker at 0.5 mile as you pass an immense slash pine with a six-foot circumference. A tall mound of duff encircles the tree, created from years of accumulation of pine needles at its base. The trail continues back into the oak scrub, where the saw palmetto takes on a silvery blue hue from the salt in the air. The prevailing sea breeze sculpts the branches of the live oaks. You enter an open, windswept scrub, the habitat of the Florida scrub-jay. The last scrub-jays were sighted here in 1990, and it’s suspected that red-tailed hawks caused their demise. Lyonia and saw palmetto makes up dense thicket up to seven feet high. You see a power line ahead, just beyond the northern edge of park. The trail turns left, returning to the shaded maritime hammock. At 1.1 miles, you cross old A1A again, entering the forest between two tall stone pillars that once served as a gateway to the plantation. You can see the sky through the trees on the right as the trail curves left to parallel the Matanzas River. At 1.2 miles, a short spur trail on the right leads out to the edge of the river, ending in a salt marsh full of black needlerush. Passing boats send waves into a sandbar covered with black mangroves. Returning to the main path, turn right to walk under the arched limbs of red bay trees. The trail makes a sharp left into a grassy corridor flanked with small trees, passing a sugar hackberry with its mottled warty gray bark. Beds of sword ferns thrive in the shade of the live oaks. You reach the end of the loop at 1.7 miles. Continue straight ahead to the trailhead, completing the Bella Vista Trail after 1.8 miles.